Geninne is an artist living in a forest near Mexico City with her husband Manolo, their two very creative boys & a cute border collie named Turbo. She was born in New York, but shortly after her parents began traveling around South America, where she lived in seven different countries and went to several English speaking schools. Her love for arts and crafts began at a very early age, her mom says she started drawing when she was two years old and it continued to be her favorite activity through her childhood and teenage years. By the time she decided what to study in college she was 100% sure it had to be in the visual arts. She studied architecture in Chile for a couple of years before graduating as a graphic artist in Mexico. 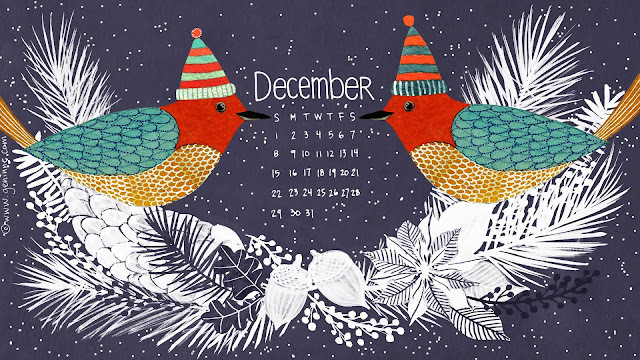 Every month she posts a new calendar with her beautiful artwork for everyone to enjoy and download for free. We are in LOVE with the December calendar and wanted to give our readers the heads up. Please visit Genine's blog at www.geninne.com and download this beautiful calendar to your computer.